Nothing new to this blog's readers, but I did make a graph to show the share of the EEG attributable to the 3 main 'renewable' energy sources in Germany, and their share of 2012 generation. If you look carefully, you might perceive solar to be extraordinarily expensive. Record applications by large electricity consumers for reductions of the renewable energy surcharge (EEG surcharge) worth up to EUR 5 billion for 2014 might further increase the burden for the remaining electricity consumers, several newspapers and website report, based on an answer of the government to a minor interpellation by Alliance ’90/The Greens. The EEG surcharge for 2013 amounts to 5.277 ct/kWh, after having steadily and often steeply risen over the last years (A table showing the development of the EEG surcharge can be found here). 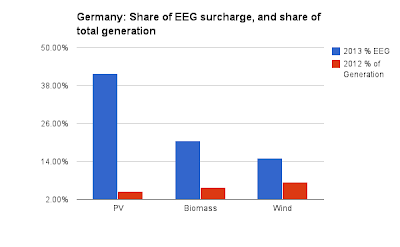 Given the above market price feed-in tariffs for renewable energy paid pursuant to the Renewable Energy Sources Act (EEG) and the steadily growing amount of renewable energy in Germany it is expected to rise again significantly in 2014. It could then be about twice as high as the market price of 27.63 EUR/MWh the four transmission system operators averaged in June for the sale of renewable energy at the European Energy Exchange. Too bad Ontarians have no solar data, and no intelligent accounting of the components of our global adjustment charge.